On Sept 29th the streets of Toronto will be converted to Nuit Blanche (a sleepless night), the contemporary art festival of the year. The festival is held from dusk until dawn. The night long event showcases different forms of art, such as paintings, sculptures, performances, and more - all for free! Below are six exhibits on display this year that you don’t want to miss! 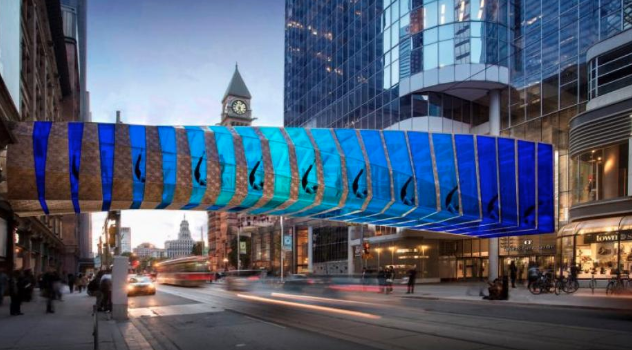 This interactive sound installation will be along Bay street from Richmond to Adelaide. DJs or musicians from LGBT, immigrant, and discriminated racial groups will perform on a stage, surrounded by police. This unique set-up of the performance calls for the audience to reflect on the tense relationship between the law enforcement agencies and minority groups while prompting the audience to participate on the dance party. The performance offers a moment of silence every hour, to honour the victims of gender and racial discrimination. Experience the surreal photon gallery at Bloor & Ossington and witness how art and technology are constantly changing our perception of the world. These artists have created a beautiful contemporary art piece. The exhibit will display a variety of interactive works from multiple artists. 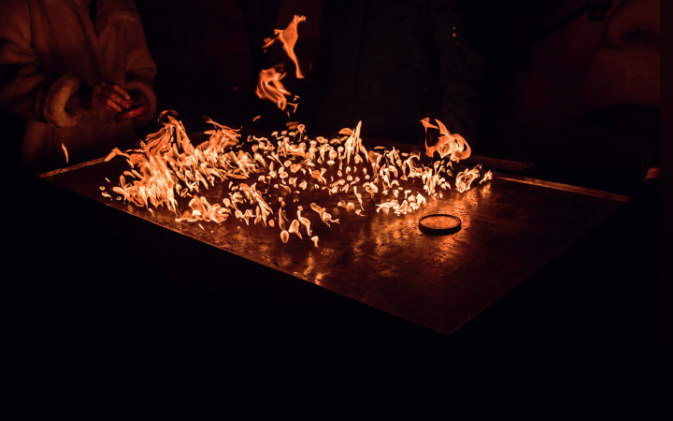 It will radiate the alleys and may be one of the most popular exhibitions at Nuit Blanche. Calling all food lovers! Particularly dumpling lovers. Savor a vast range of dumplings, patties, momos, empanadas and pierogies of different ethnic variations. Entry is free, but the food will be for sale. Now, the festival returns some of the culture that once inhabited the neighbourhoods of this enclave and the stories that accompany them. The vendors will be sharing their background and stories of the hardships faced in their businesses. In addition to the food, the Chinese-Canadian artist Ken Lum will include illustrated banners showcasing the preserved memories of the marginalized communities. Don’t forget to stop by Larry Sefton park for a magical experience. This exhibit displays work from Nadine Bariteau, a teacher at OCAD who specializes in printmaking. The audience will walk through this exhibit looking up to see the artist’s flying prints; a mesmerizing take on the natural world. The artist wants the audience to look at her work and contemplate the question: do angels exist? The moving figures in the winds of Toronto can cause minds to wander. This exhibit gives us a chance to see the glass CF Eaton center bridge in a new light - quite literally. The bridge will be temporarily used as an alternative space for a unique set of dance choreography consisting of acrobats performed by circus artists. The performance will highlight the bridge’s architecture using different slopes of light and the unique choreography. Toronto is a huge city. In massive crowds of the city one can lose one’s sense of individuality and identity. This sculptural installation calls for the audience to peel dry glue off their fingers to view their own fingerprint and reclaim their identity as the thousands of unique fingerprints are hung up on the ceiling and shimmering. Together, everyone will be “making their mark” in one of the most diverse cities in the world.